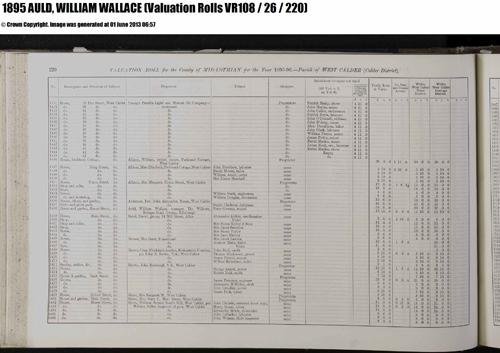 28 May 2013 saw the launch of the 1895 Valuation Rolls on the ScotlandsPeople website, so this weekend I decided to have a look and see what sort of information could be retrieved from the (VR) Rolls. To see how many Auld names are listed in the 1895 Valuation Rolls an initial search was performed using the AULD name and the 'Exact surnames only' option. The result ended up with 735 matches (or thirty pages of results). In order to narrow the results down a tad, West Calder was selected from the comprehensive list of Parishes - results one match on one page of results. As users of the ScotlandsPeople website will know, the site uses pre-purchased credits. These credits in turn are used to purchase certificates / register entries / census records and valuation rolls. For the 1895 Valuation Rolls. one credit is required to view one page of your search results and a further two credits are required to view each page of the Rolls. Viewing the results of my search revealed a surprise in that my 2nd Great Great Uncle William Wallace Auld was listed. From all of the information I had previously collected on William Wallace Auld and my particular branch of the Aulds, the family could be tracked growing up in the small village of West Calder, before they moved into Edinburgh to continue their shoe/boot making business. Wanting to know more I proceeded to view the Rolls. What one gets is a fantastic page of typed information that lists the property in question, who the proprietor of the property is including their address, name and occupation of the tenant if the property is tenanted, plus the rates paid for rent. Previous research using census records and BDM certificates, although extremely valuable in placing an individual at a particular residence at that point in time, did not provide the researcher the wider picture in relation to real estate assets owned by a person. This is where the Valuation Rolls come into their own and may fill some gaps. The other advantage is that individuals, be it only head of household and property proprietors, can now trace in the middle of the ten year 1891 and 1901 census cycle. Another fantastic resource offered by ScotlandsPeople. Well worth a visit if you haven't been to the site in a while.